Two years ago I participated in a competition for the use of chestnut flour. After I made “Chestnut Gnocchi with Autumn Sauce” I had advanced the flour and thought I’d use it to create this dish. It is very fast and tasty. This dish is suitable for this season. It can also be used for Christmas lunch in case you want to do something original but fast. 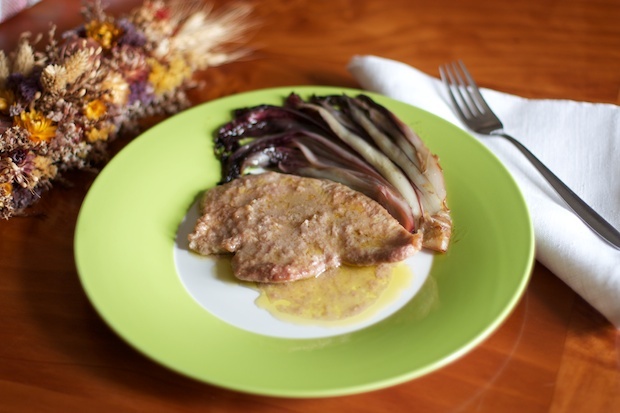 In a bowl add the chestnut flour, coat well both sides of the slices of turkey. Add the olive oil in a pan along with the garlic and bay leaf. Turn on the heat and when the oil is hot drop the slices, cook 5 minutes per side, then pour in the wine and let it evaporate. Season with salt and pepper, and continue cooking over low heat for another 10 minutes. Turn off the heat. Serve hot with some of their sauce and stewed radicchio.